This set makes DIY cyanotype printing as easy as can be. The chemistry comes pre-measured in lightproof black bottles. 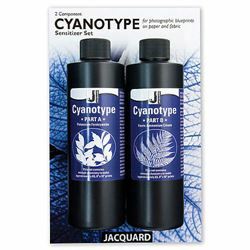 Simply fill each bottle with water to create Stock Solutions A & B and mix the two in equal parts to create the cyanotype sensitizer. Coat fabric or paper with the sensitizer and, once dry, create prints by exposing to sunlight or UV (3-15 minutes, depending on conditions), using objects or a film negative to create an image. After exposure, prints are processed in a tray of cool water and allowed to air dry. This set contains enough chemistry to make approximately 65 8.5" x 11" prints on paper or 50 8.5" x 11" prints on fabric, depending on the absorbency of the substrate. The set includes Part A Potassium Ferricyanide, Part B Ferric Ammonium Citrate and instructions.